With Peter Robinson retired, the impact of yesterday’s High Court ruling on him is negligible. But the decision could provide further reason for the DUP and Sinn Fein to come closer together than ever before. Mr Justice Maguire has held that Mr Robinson broke the Ministerial Code because he did not take a controversial decision to the Executive. It is not the first time that an Executive minister has found themselves censured by the High Court on those grounds, but there is particular irony in Mr Robinson being found in breach of that aspect of the code. It was the DUP – with Mr Robinson as the party’s key negotiator – which at St Andrews argued that they had reined in ‘rogue’ Sinn Fein ministers by ensuring that any decisions which were “controversial or cross-cutting [decisions involving more than one department]” were brought to the Executive as a whole, thus limiting each minister’s power. The DUP subsequently – and rightly – claimed that such a mechanism made it impossible for the then Sinn Fein Education Minister Caitriona Ruane to make policy on post-primary education without the DUP’s consent. There have been a series of court cases – at least two of which have seen DUP ministers successfully take nationalist ministers to court – in which that aspect of the ministerial code has been upheld by the courts. 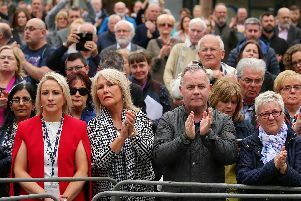 But yesterday’s decision shows that the DUP’s ministers are as limited by the clause – and the word ‘controversial’ could be broadly defined – as their Sinn Fein counterparts. Therefore, if the two parties are to oversee a coherent government, they will need to agree controversial decisions between them at Executive level, rather than simply turning a blind eye to controversial decisions made at departmental level. Otherwise, any member of the public could challenge them in the courts.